Indian Chicken Tikka Masala Recipe, a delicious curry that is super easy to make, yet aromatic and so comforting. 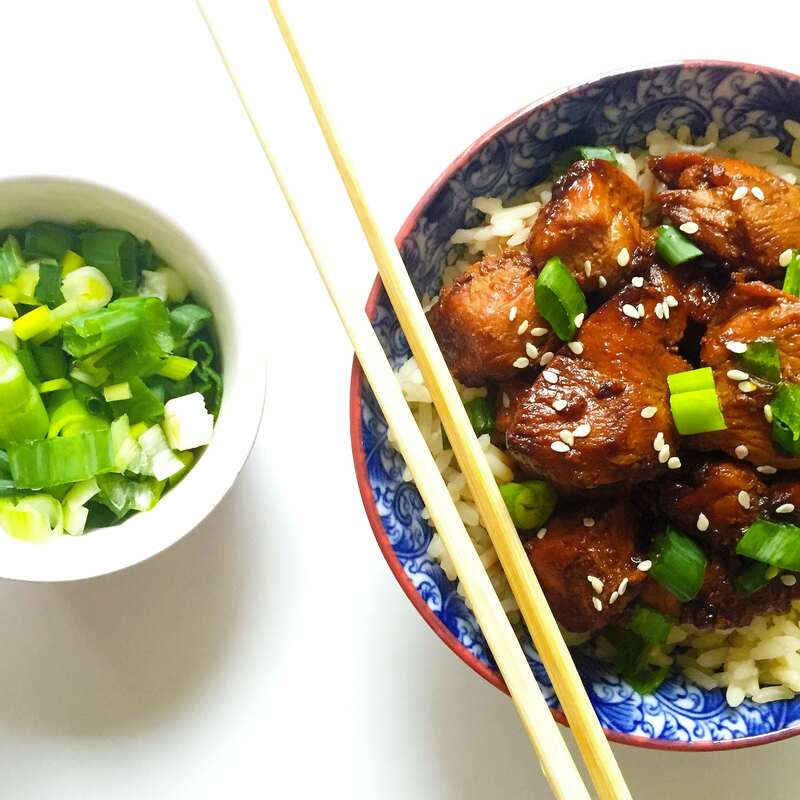 This homemade version easily beats any take-away. A delicious family dinner that is ready in 30 minutes. To say that British people like curry is definitely an understatement. They absolutely love it; to such extent, that curry has been adopted as a national dish. That makes it a favourite when it comes to having a take away too. My personal favourite is chicken curry, but l wouldn’t say no to beef, fish or vegetable curry either. As l might have mentioned before, lamb is not quite my thing, so l would just politely say no to it. Together with the Butter Chicken the Indian Chicken Tikka Masala Recipe has to be the tasties curries that can be prepared at home easily and that is just 30 minutes or so. It was actually in London where l first tried curry, and, although my first impression was, nope, that’s not for me, l got to appreciate a good curry. I guess the strong spices can be a bit overwhelming for someone used to kind of plain food. My chicken tikka masala is by no means an authentic Indian recipe, but it tastes like the real deal, and l’m quite proud of it. It is pretty mild, and l chose not use add any chilli to it, as the spices used plus the ginger give this dish that particularly fragrant taste one expects from a good curry. But, of course, one is more than welcome to add some green or red chilli, all to taste. I also don’t like adding sugar to the sauce, there is really no need for that, according to me, at least. What really makes it a proper tikka masala is the mixture of spices. The one thing you can’t possibly skip is the coriander or cilantro leaves. To me, coriander says Indian food, mainly because I only use it when I cook Indian dishes. My sister got to like Indian food too, whenever she visits us, she likes to have a nice portion of chicken tikka masala. It’s the kind of dish you get to love, and want more of it. Make a big batch and freeze some more later too, that will save some time. 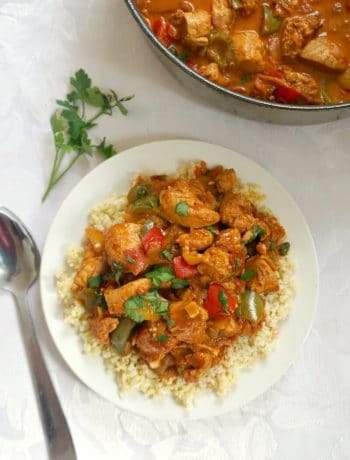 If you’ve liked my INDIAN CHICKEN TIKKA MASALA RECIPE or any other recipe on the blog then don’t forget to rate the recipe and let me know how you got on in the comments below, I love hearing from you! You can also FOLLOW ME on FACEBOOK, and PINTEREST to see more delicious food and what I’m getting up to. Indian Chicken Tikka Masala Recipe, a delicious curry that is super easy to make, yet aromatic and so comforting. This homemade version easily beats any take-away. Peel and cut the onions, garlic cloves and ginger. Heat up the oil in a pan and fry the onions on a medium heat until golden. Add the garlic and ginger and stir for 10-15 seconds. Chop the tomatoes and add them to a pan. Mix well and cook until the tomatoes are mushy. Next, add the chicken breast, spices and water and leave to cook until the water has been absorbed and the sauce begins to thicken. Add the tomato purée, yogurt and tikka masala paste and check if it needs any salt or pepper. Garnish with fresh coriander or parsley. Remove from the heat and serve hot with basmati rice, naan or pitta bread. Your chicken tikki masala sounds perfect. I prefer things not as spicy and your recipe sounds perfect for me. My neighbor makes a spicy version and its good but sometimes a bit spicy for some. Love how easy this is to make. Thank you, Ali! I can’t have it too spicy either, l find that this had the right amound of spiciness for my taste, l hope you’ll like it. Yum! Our family loves Indian style curries so we would love to try this. The “easy” factor is a big win for me as well. Thank you, Elissa! It’s indeed so easy to make it. Such a beautiful dish. My husband couldn’t get enough Indian food while we were living in Nairobi (there is a sizable Indian population there). . .and not a day goes by that he doesn’t make mention that he misses the food there. I’m definitely going to need to make this for him.